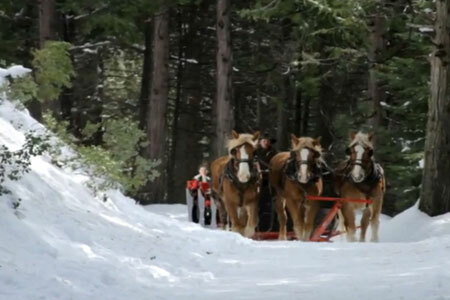 Can you think of a better way to get into the holiday spirit than to go for a sleigh ride? 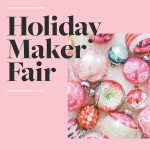 Just imagine what it would be like to ride in an open sleigh through a winter wonderland—sleigh bells ringing, snow glistening, carolers singing… Sounds lovely, doesn’t it? Below I’ve rounded up a few places for you to go this winter. So whether you’re planning a family trip or want to surprise your sweetheart with a romantic outing, throw on your winter coats and go on a sleigh ride! While enjoying a fun-filled winter holiday in upstate New York, head to Lake Placid for a sleigh ride. Gliding through the snowy countryside will be an experience your family will never forget. Three different sleighs are available to accommodate groups and couples, and they are even equipped with heated seats and thick blankets to keep you warm! Go here to make a reservation online. Just 45 minutes outside of Cleveland, Ohio, Ma & Pa’s sits in the heart of Amish country. Pa hitches up the sleigh and drives you through the woods before bringing you back to the cabin for cookies, hot cocoa, and coffee. After you’ve had your fill, stop in Ma & Pa’s Gift Shop and pick up some of their delicious maple syrup (made in-house!). Call ahead to reserve your ride, but keep in mind that reservations can only be made a week in advance based on snow conditions. 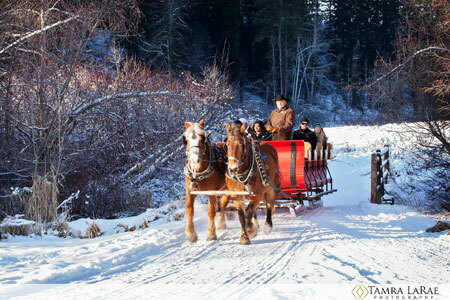 Whether you live in Jackson Hole or are visiting for winter vacation, stop by Mill Iron Ranch for a sleigh ride. As you ride through the picturesque Wyoming scenery, you’ll be in awe of the impressive mountains and numerous elk. At the end of the ride, you can enjoy a hearty dinner at the Mill Iron Ranch lodge. Call the ranch to make reservations. 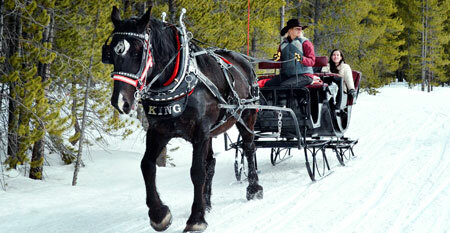 The crisp winter air and snowy scenery add to the wonderful experience of sleigh rides at Mountain Springs Lodge. Sleigh bells jingling, snow crunching under the horses’ feet, and the snow glistening in the sunlight all add to the magical experience of riding through the frosty countryside. They offer a few different packages: sleigh ride only, sleigh ride with breakfast, or sleigh ride with dinner. If you’re near Portland, Oregon, then you’ll want to drive over to Mt. Hood Adventure this winter season. Climb aboard a sleigh and take the village tour which guides you through historic Government Camp where you’ll enjoy the glowing holiday lights. Click here to purchase tickets. 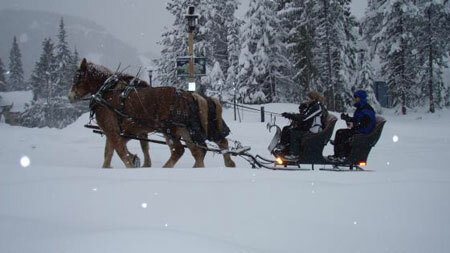 The fine folks at Nordic Sleigh Rides in Breckenridge, Colorado offer a few different sleigh rides. Reserve a private sleigh if you are planning to pop the question or want to enjoy time alone with your sweetie. For a family affair or an outing with friends, you can ride in the large red sleigh driven by two Belgian draft horses. Click here to make your reservation today! At Yosemite Trails in California, you’ll enjoy a fun-filled experience as you ride through the snowy trails in a sleigh driven by a cowboy. 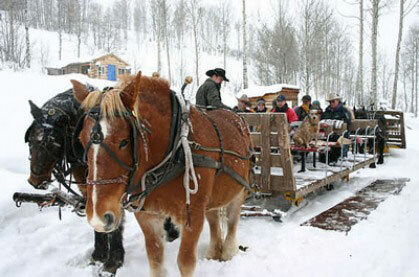 The sleigh stops in Skidders Camp where you can toast marshmallows and sip a cup of hot cider. When you’re ready, you’ll hop back in the sleigh to return to the lodge. 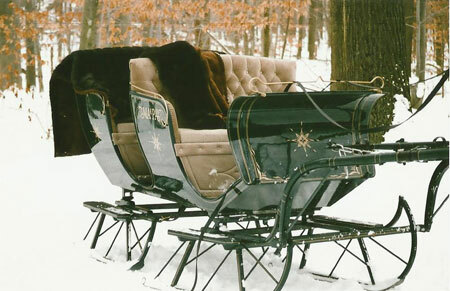 As weather conditions vary, they may substitute the sleigh with a wagon if the snow levels are too low. Call ahead to verify the sleigh is running. There are so many more places to go for a sleigh ride! While I would love to tell you about all of them, I must return to my other elfy tasks. After the jump you’ll find a list of some more sleigh rides across the continental U.S.